» What Was Going On Inside Metta World Peace’s Head? 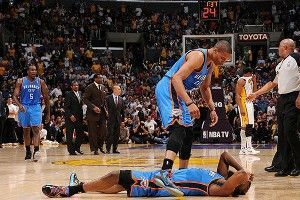 What Was Going On Inside Metta World Peace’s Head? No one knows why it happened. Not you, not me, and if I had to guess, not even Ron-Ron. Immediately following the incident (after 50-plus slow-motion viewings), shockingly confident opinions were tossed around about whether World Peace threw the elbow as an act of malice or whether Harden was simply in the wrong place at the wrong time. Initially, I too wasn’t immune to this knee-jerk reaction of Ron knowledge, and I claimed that I doubted Artest meant to do it. But after quickly reading back my tweet, listening to commentators talk about the blow, and remembering exactly who Metta World Peace is, it became clear that understanding intent was completely impossible. Claiming to truly ever understand what was “going through World Peace’s head when he did _____” is — and may forever be — a completely useless conversation. Still, points were made for and against his intent, guilt, or innocence, based on what one saw in the replay. Some people noted his history of violence. Some said he was a changed man. Some said he was caught up in the moment. Others said he must have felt Harden on him. Yes, these are all true, and yes, they all make the incident more complicated to understand, but thinking any of these actions or opinions gives anyone a clue into why World Peace did what he did is ludicrous. They are simply observations, not indicators of intent. If anything tells us why attempting to wrap our brains around his brain is a exercise in futility, look at the three tweets Metta sent over a five-hour period, postgame. Wow.. Didn’t really think Kendrick Perkins broke my nose….Super sore… Basketball too emotional ……. Again, one could look at these and further speculate about what goes on in that head of Metta’s. Do these three tweets show genuine empathy? Is he making light of the situation? Does his misspelling of Harden’s name show he couldn’t care less? Is his bringing up his own injuries an attempt to deflect attention? Or does he feel horrible, but is simply incapable of appropriately expressing himself via Twitter? Again, these are all logical and appropriate opinions to derive from Metta’s actions, but again, they don’t actually tell you anything about his brain. If nothing else, they complicate the matter more, with “omgs” and messy ellipses and odd storytelling working contradictorily to a man with an unfortunate habit of hurting those around him. While I respect an expert’s “expert” opinion, this is one of those times when everyone should just admit defeat and become comfortable with the phrase, “I just don’t know.” As someone who “just doesn’t know” all the time, trust me when I say it’s OK. Just remember you have every other thing on earth to claim to understand. Let this one go.